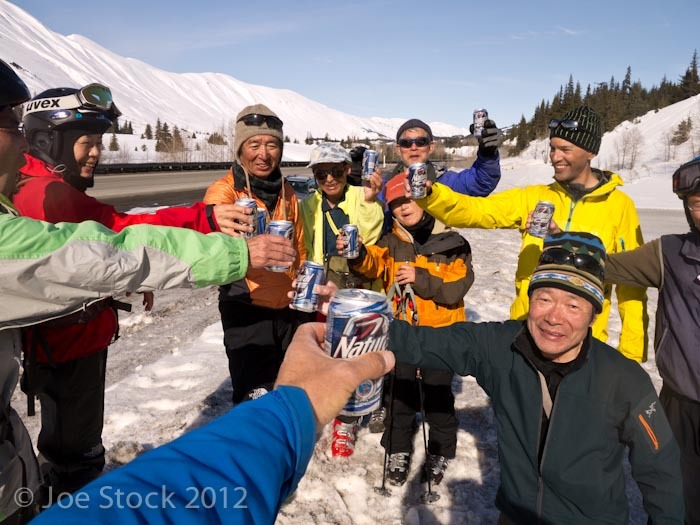 In April 2012 Chuck Olbery, owner of Hokkaido Powder Guides, brought a group of eight Japanese to Alaska for a Ski Road Trip. 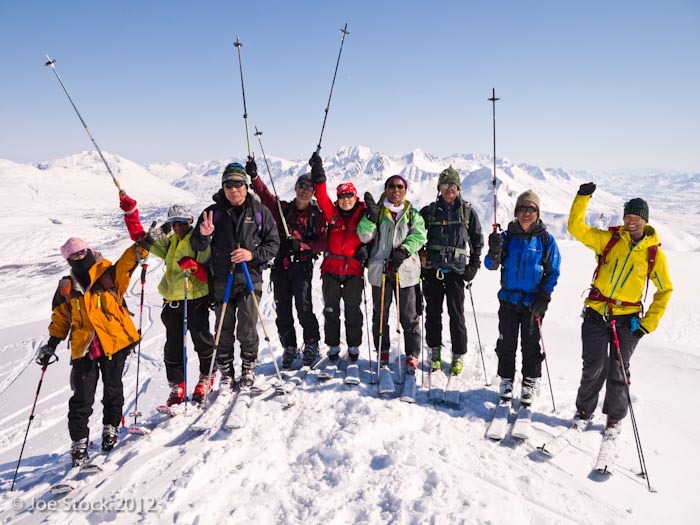 Over 12 days we skied Turnagain, Summit Lake, Thompson Pass and Hatcher Pass. Chuck and I gave them the ski trip of their lives. The Japanese gave me lifelong inspiration. Our first run of the trip. Superbowl at Turnagain Pass in the Kenai Mountains. 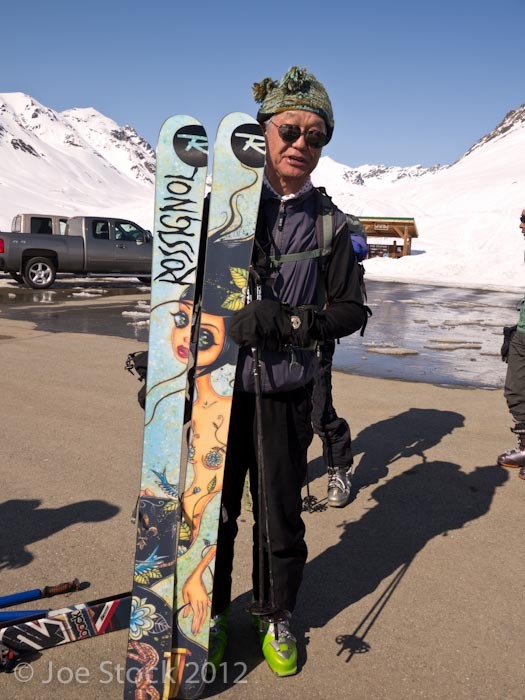 Seventy-year old Tadashi Miura, hitting it hard in Superbowl. Ready to put boots on at Hatcher Pass. Efficiency, whole foods and exercise appear to be the key to Japanese longevity. At Thompson Pass, Jed Workman told Chuck the heli procedures. Chuck translated to the crew. Chuck also explained that Jed's long hair and beard meant he was a real Alaskan. They all smiled and nodded and said "ahhhhhh, hairy Alaskan." 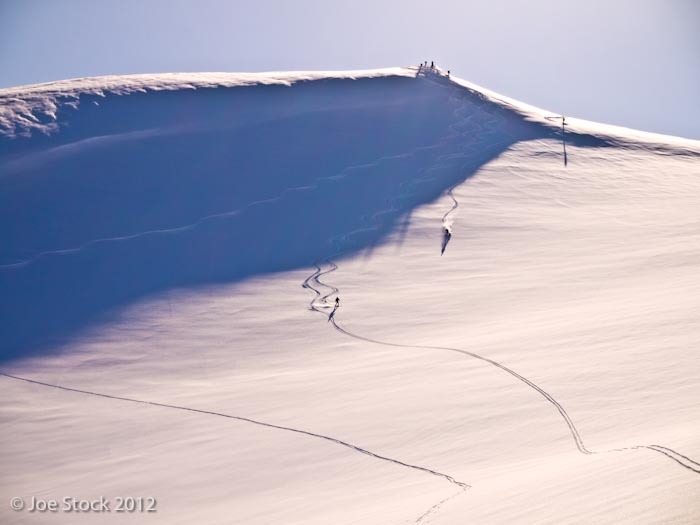 Jed dropped us among fields of untracked powder. We skinned three laps and then skied to the road. For educational purposes we stopped at the sledneck fest of Tailgate Alaska. At 9am the fest was still sleeping. On the summit of our last run of at Thompson Pass. 4,000 feet of velvet duff on the flanks of the Worthington Glacier. Yoko Onoda shopping at the Hub of Alaska in Glennallen. They also found great shopping at the Girdwood Tesoro. Yoshikazu Inoue introducing me to Tammy. Tammy worked at the hut were they skied in Canada last year. Japanese don't like sweets. And the don't like sweet beer. That means every micro brew in Anchorage was eliminated. They settled on ice beers: Nati Ice, Genesee Ice, Milwaukee's Best Ice. One ice beer into a 110 lb 68-year old after seven hours of skiing...the van rides back the B&B were lively. 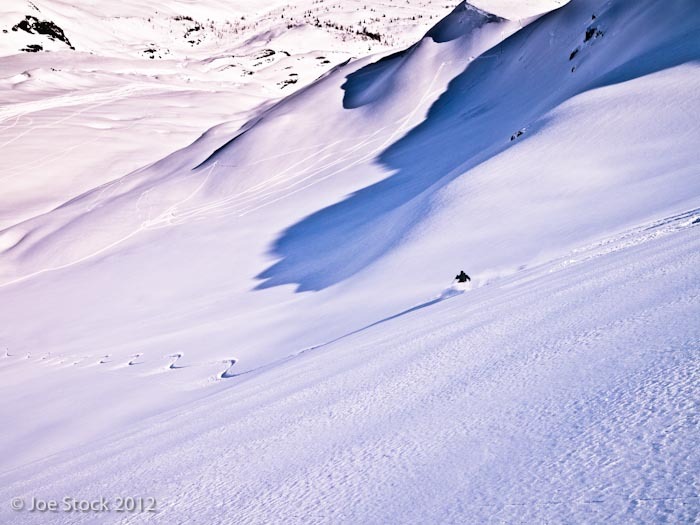 Final run at Hatcher Pass in the Talkeetna Mountains. Thanks for a great trip Chuck and the Hokkaido Powder Guides crew! I hope to ski with you again soon. Cheers!